The purpose of the English Language Development courses is to provide intensive language instruction to prepare students for success in mainstream courses. 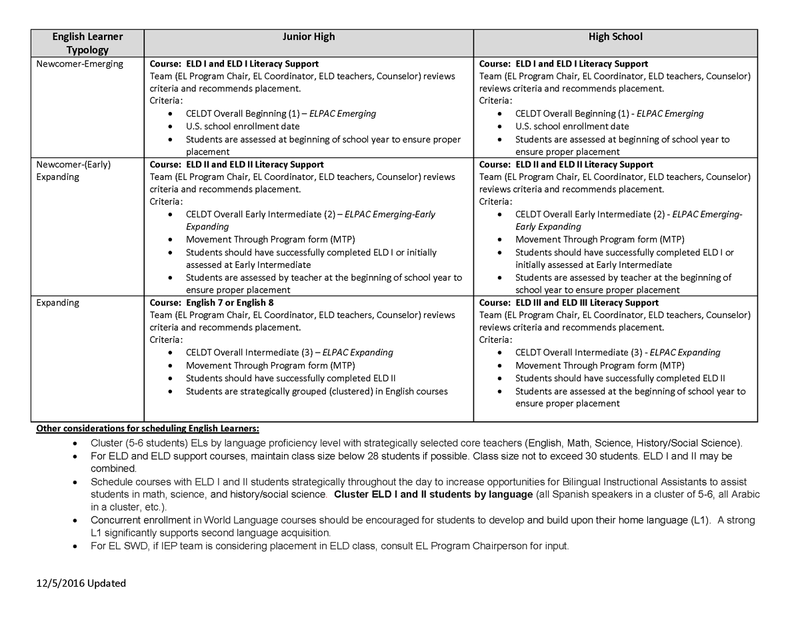 Designated ELD is a one period protected time during the regular school day when teachers use the CA ELD standards as the focal standards in ways that build into and from content instruction. The courses support ELs in developing the discourse practices, grammatical structures, and vocabulary necessary for successful participation in academic tasks in all content areas. There is a strong emphasis on oral language development, reading, and writing as students learn to use English in new ways and develop their awareness of how English works in both spoken and written language. Integrated ELD is taught throughout the day, across the disciplines using the CA ELD standards in tandem with the CCSS LA/Literacy standards. Prerequisite: Teacher recommendation. ; CELDT Beginning and Early Intermediate Levels Must be enrolled concurrently in elective ELD I Literacy Support. This integrated ELD standards-based introductory course for English Learners follows the natural progression of language acquisition and development, listening, speaking, reading, and writing. Major emphasis is on listening, oral language development and English language literacy. This designated ELD course continues to focus on writing, reading, and oral communication, and builds into and from content area classes. Reading and writing are focus areas in order to develop the critical language English learners need for content learning in English. Prerequisite: District placement/movement criteria; Teacher recommendation; CELDT Early Intermediate and Intermediate Levels. Must be enrolled concurrently in elective ELD II Literacy Support. This integrated ELD standards-based course for English Learners continues to focus on writing, reading, and oral communication. Major emphasis shifts from listening, speaking and initial English literacy to intensified practice in English oral academic discourse, reading, and writing skills. Requirement: Concurrent enrollment in mainstream English 7 or English 8. Elective credit only. This course provides designated language development for mainstream English learners. For EL students exiting the ELD program and entering the regular English course offerings, this serves as a transitional support English language development class. For LTEL students already in the mainstream setting, this serves as needed language development support. The course emphasizes academic language development, structured oral and written practice, reading strategies, and builds into and from content area classes. 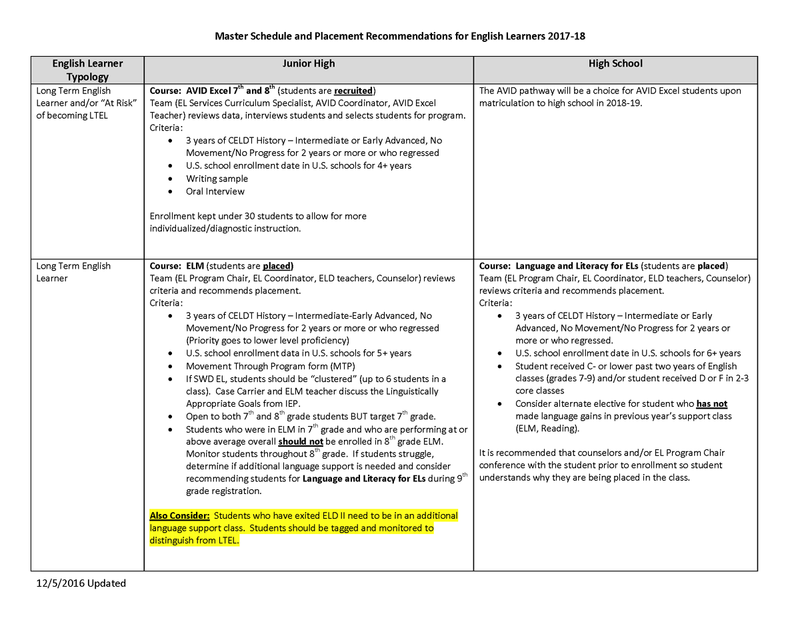 Requirement: Concurrent enrollment in mainstream English 7; Teacher recommendation; CELDT Intermediate for 2 or more years; students are recruited by the AVID Excel District Leader. This course targets English learners who are long-term ELs or at risk of becoming long term ELs. The course is designed to accelerate students’ academic language acquisition and put them on a pathway to high school AVID and college preparatory coursework. Students are grouped by grade level.